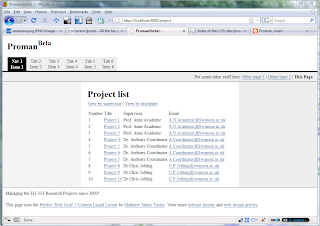 A blog for the developers of the Proman student project mamagement tool being developed at Swansea University by Dr C.P. Jobling and his students Nikolai Parashkevanov, Tony Goa and others. Authorization by declarative_authorization (see RailsCasts #188), or, if that's overkill CanCan (see RailsCasts #192). Saner views and CSS using Compass, Haml and Sass (listen to the changleog podcast 0.0.1 for inspiration for this). A compass compatible view template framework such as YUI grids or blueprint. Formtastic forms (see RailsCasts #184 and #185. From the videos released since May 2009 on Ryan Bates' RailsCasts, there are a few other interesting tools to try out, and I'll be checking out more of these over the next few weeks. Watch out for more posts on this topic as I get to grips with this stuff. Proman has been accessible to students since last Friday. I still have to implement the selection algorithm, but they can browse the projects. The source code has branched and now ca be found at http://github.com/cpjobling/Proman2/tree/master and Google code at http://code.google.com/p/proman2/. The project history, since the branch, is only stored in the Gitbub repo, and I would prefer to stick with Github as the main hosting site. It has the better UI. I will continue to upload commits to Google code, but the full history can be tracked on Github. Project views use jQuery for client-side table sorting, paging and "accordian" views. Namespaces have been exploited to simplify the access features: for example to provide protected areas for admininstration, coordination and staff-project creation. CVS uploaders for staff, student and project details: makes initial population of the program work without the need for a registration step (there wasn't time this year!). Hosting on the "cloud" via Aptana. Still quite a bit to do, not least providing the actual mechanism for project selection, but the program will be available for preview from proman2.aptanacloud.com very soon. Hopefully, when the dust settles, I'll have some time to document some of the design ideas built-in to the tool. Today I started to work on a layout for the Proman web application. I have started by adopting Matthew James Taylor's Perfect 3-Column Liquid Layout. I will then set up the templates for the rails app using this template. Finally, I will add decorations to add SU branding. The dimensions for the liquid style are set as shown below. These of course can be adjusted. I have unit (model) tests in place for users, roles and projects and the functional (controller) tests now work again for the user and session controllers. Migrations continue to work properly. The views and hence the web application itself may well be broken. I need to add a few more unit and functional tests before I'll be in a good position to get the views working properly. And then, when I've got that done, I can think about adding some style and deploying. Unfortunately, I have a busy spell of marking and meetings ahead, so the next-few week's activity will be part-time. Migrations fixed ... now for some tests! I've been away for the weekend: but I've been doing some reading and today have managed to refactor the migrations in Proman so that they now work (both up and down). I have also fixed the tests so that I can start to write some unit tests. Once we have unit tests in place, I can start to validate the web application itself.